Truth be told, I’m not a huge fan of pork. I know it’s “the other white meat” so I try to find appealing recipes to try so we don’t eat the same thing all the time. I usually cook pork tenderloin, so I used pork tenderloin cutlets. Hubby purchased a large cut of tenderloin so I cut part of it into cutlets. This third recipe for the 52 Week Recipe Challenge comes from a Better Homes and Garden publication called All Time Favorites. My local library has a Friends of the Library bookstore and I purchased it for a whopping .05 cents! It’s chock full of yummy recipes. I thought the orange was lacking and would use a bit more and maybe some zest next time. The pecans don’t stay on the cutlets and it might be better to stir them into the glaze and serve over the sautéed pork. I served this dish with rice and steamed green beans. Trim pork, then cut into 1/2-inch think slices. Flatten slices with palm of hand; season pork with salt and pepper. Place 3 tablespoons of the syrup in a shallow dish; place pecans in a second shallow dish. In a very large skillet heat oil over medium heat. Coat pork in syrup, then press in pecans. Place the pork in skillet in single layer; top with remaining pecans and syrup from the dishes. Cook 3 or 4 minutes or until all juices run clear, turning once. Remove pork from skillet and with slotted spoon remove any pecan pieces. Spoon over pork. Juice one of the oranges. Stir orange juice and remaining 1 tablespoon maple syrup into skillet. Cook, uncovered, for 1 to 2 minutes or until slightly thickened. Pour over pork. Cut remaining orange into wedges. Serve pork with orange wedges. 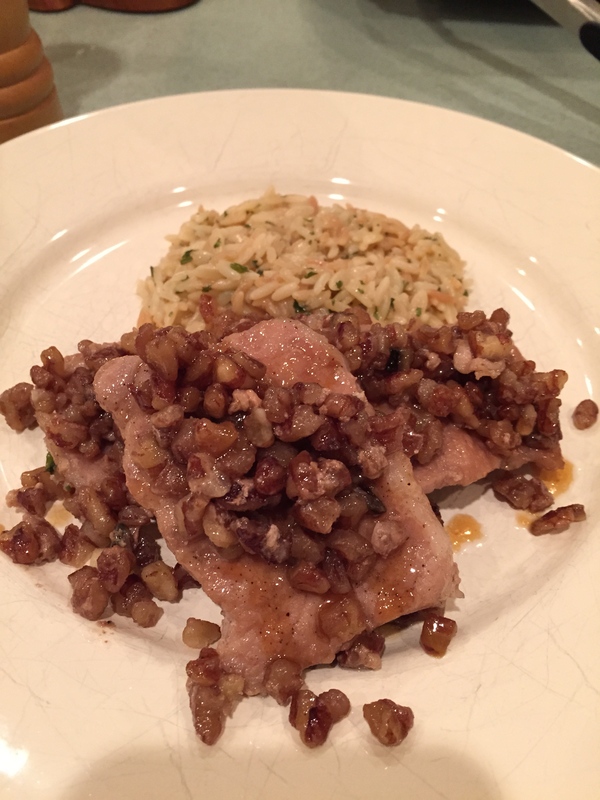 This entry was posted in 52 Week Challenge, Entrees and tagged dinner recipe, orange, orange maple glaze, orange-maple sauce, pecans, pork cutlets, pork recipe, pork tenderloin, sautéed pork, the other white meat. Bookmark the permalink. This is the next recipe I am going to try. I also went to one of the other blogs listed (Blaise the Baker). I’ll check out the other 8 after the Academy Awards. Great blog!